Monday might be the best time for shopping, why? Because jobs start on Monday, common sense? Oh well, my sisters and I went for it. 9a.m., waited for my buddy, X, to send us to Jalan Bukit Bintang, as he wanted to Low Yat Plaza to seek for a PC Fair's part-time job, and so we prepared and headed to Sungei Wang. As usual, first destination, Sungei Wang. FREE transport, thanks buddy! Expect traffic conjunction around Jalan Bukit Bintang, oh well, expect the unexpected, reached there way too "late" until most of the shops closed haven't open. So and so, time for shopping has began, except for me and my buddy X. After quite some time, my buddy X went back. After dealing with Sungei Wang and Times Square completely, my sisters and I planned to head to Pavilion. On the way to Pavilion, guess what we saw outside Sungei Wang? The Gold Man. Wow? 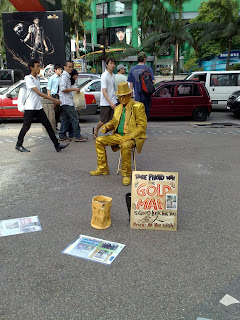 After took 1 picture, The Gold Man stared at me one kind, I was wondering, why? So I ignored him and headed to Pavilion for one hour. One hour later, we walked back to Sungei Wang and he's gone! Until I reached home and viewed back the picture, then I found out the reason on why he stared at me, because I did not pay him! Sorry The Gold Man! If there is a chance that we could meet again, I will pay you. I know you spend a lot on colouring your clothes and the efforts that have been made. Sorry again! Hopefully it's not too late; make no sense, he wouldn't know I had made an apologise. Anyhow, still sorry! 5p.m., we planned to go home by transiting Monorial to Putra LRT, currently known as Rapid KL. However, on the way to Monorial Station, my sister's eagle eyes spotted our dad's car, stucked in the traffic conjunction, *laughing*, we called him and so, another FREE transport! So coincidence? So lucky? No doubt. Thanks to The Gold Man I guess?